On Valentine's Day, Aishwarya Rai Bachchan Hearts This Fam Pic Of Abhishek And Aaradhya. Aww! 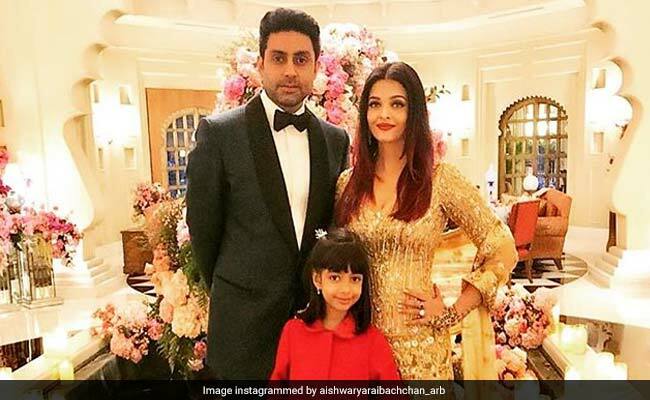 On Valentine's Day, Aishwarya Rai Bachchan treated us to a stunning family photo, also featuring actor husband Abhishek and daughter Aaradhya. The former beauty queen zeroed in on a photo from Isha Ambani's pre-wedding bash in Udaipur as her Valentine's Day-special post. It appears that "no caption needed" is what Aishwarya meant as she simply added the heart emoji to the photo, which appears to have been taken moments before the trio had stepped in to the party venue at Udaipur's City Palace in December. Aishwarya was a vision in a golden ensemble paired with a dupatta while Abhishek complemented her in a suited look. Aaradhya was cute as ever in a red frock worn with white shoes and matching hair accessories. On Valentine's Day, Aishwarya Rai Bachchan shared another stunning picture of herself along with her daughter Aaradhya on her her Instagram profile. On the work front, Aishwarya Rai Bachchan was last seen in Fanney Khan. She will reunite with Abhishek Bachchan on the big screen after almost a decade in Gulab Jamun, which will be directed by Anurag Kashyap.